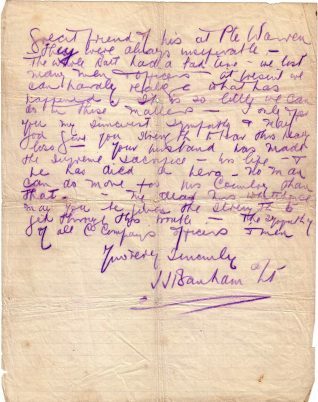 I am so sorry I have not been able to write to you before but I have been unwell – I am your husband’s platoon commander and I want to write to you to offer my sympathy in your heavy loss – Your husband at the time of his death was placed in a bombing post situated at one of the craters which the huns blew up on the 14th inst. 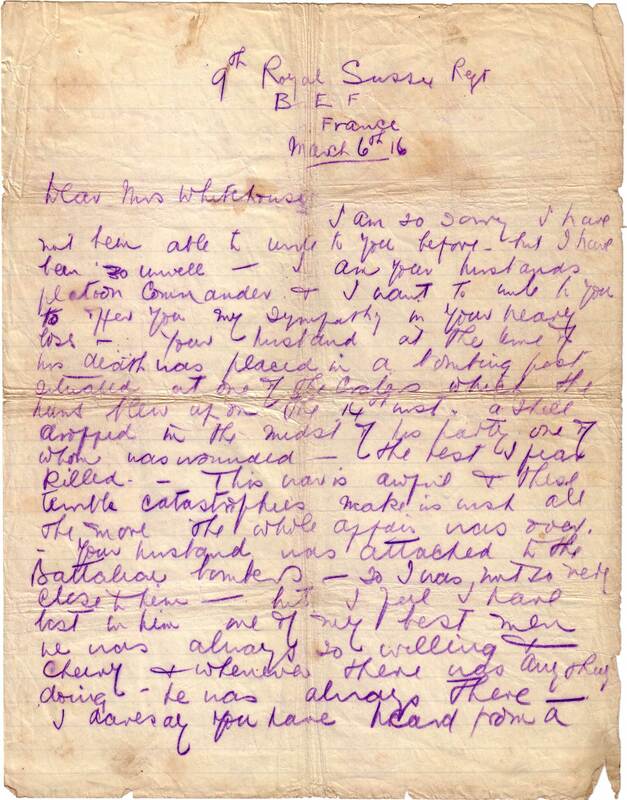 A shell was dropped in the midst of his party, one of whom was wounded – the rest I fear killed – This war is awful and these terrible catastrophes make us wish all the more the whole affair was over. 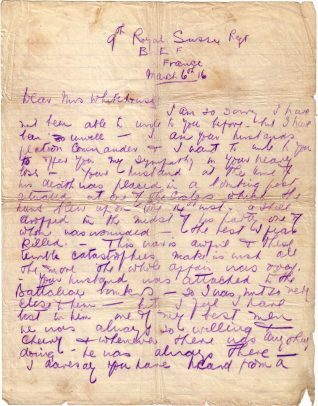 Your husband was attached to the Battalion bombers – so I was not so very close to him – but I feel I have lost in him one of my best men. He was always so willing and cheery and whenever there was anything doing – he was always there. I daresay you have heard from a great friend of his Pte. Warren. They were always inseparable – The whole Batt had a bad time – we lost many men and officers – at this time we can hardly realize what has happened. It is so little we can do in these matters – I only offer my sincerest sympathy and may god give you strength to bear this heavy loss – Your husband has made the supreme sacrifice – his life – and he has died a hero – no man can do more for his country than that. 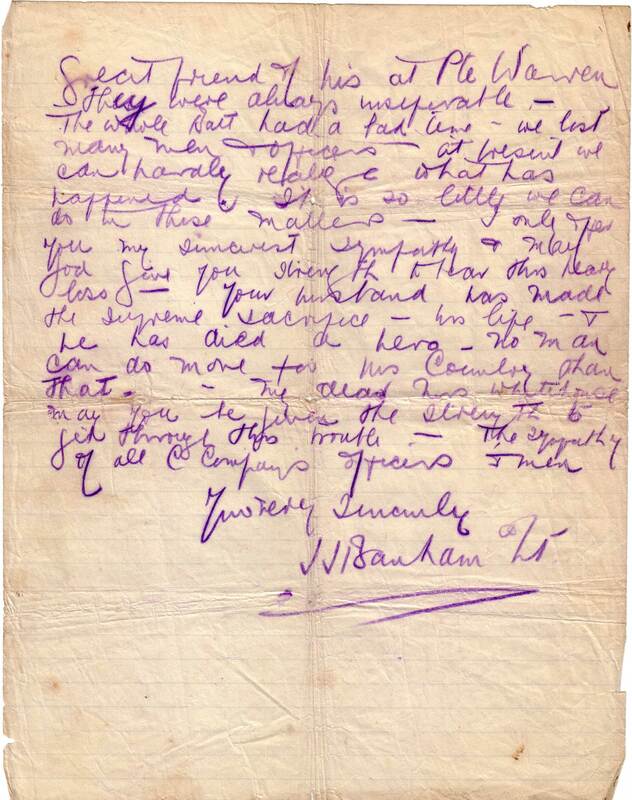 My dear Mrs Whitehouse may you be given the strength to get through this trouble – The sympathy of all C Company’s officers and men.